Cordless electric kettle with 1.2 litre capacity and 360 degree base. -UK electrical plug. -on/off button with blue light indication. -optional wall mount, ergonomic handle, one touch opening, water level indicator. Cordless electric kettle with 1.2 litre capacity and 360 degree base. -sandblasted aluminium finish. -UK electrical plug. -optional wall mount, ergonomic handle, one touch opening, water level indicator. Condition is New. It has a lovely tactile beech wood handle and a softly curved lip for easy pouring. A simple steel jug design with an insulated double wall to prevents it from getting as hot as other kettles and a dry-boil safety switch and automatic switch off. CORDLESS DESIGN – Forget about cords because our ceramic kettle is made with a cordless design. 1 LITRE CAPACITY – Our kettle is designed to fit 1L of your favourite tea or hot beverage. 360° ROTATING BASE – You can spin our kettle the way you want because of the 360 degrees rotating base. Alessi Electric Kettle Black & Silver Model MG32 - Michael Graves Design. Condition is Used but very good. Cordless with 360 degree base. Attractive floral rose flower pattern. 0.8 litre capacity and up to 1500 watts of power. Ceramic Country Rose Kettle. 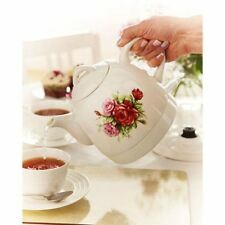 1x Ceramic Country Rose Kettle. Classic styled teapot from lightweight ceramic. Gorgeous cordless kettles. With an automatic safety cut-out to prevent boiling dry. It is our aim to get a reply to you with in 24hrs. Dr. Hetzner Electric thermostatically controlled designer Kettle BNIB. Condition is New. Dispatched with Royal Mail 2nd Class. Cordless Electric Kettle 2200W 1.8L, Stainless Steel with Marble Effect - White. Generous 1.8L capacity cordless jug. Removable and easy clean water filter. Clear water level indicator with marks. The narrow funnel of a ceramic kettle ensures precise and safe pouring of water. The kettle is equipped with a double security system. Did you forget to pour water into the kettle?. No problem, the kettle will turn off automatically. Cordless electric kettle with 0.6 litre capacity and 360 degree base. -sandblasted aluminium finish. -UK electrical plug. -optional wall mount, ergonomic handle, one touch opening, water level indicator. Sfera marble effect kettle is not only stylish, but also practical. Your Sfera kettle is complete with a LED power on indicator. This stunning 1.8L kettle is designed with a clear water level gauge. This is an. Kettle and vacuum flask(2- in-1). With double-walled vacuum flask in stainless steel. Cool-Touch– heat from the flask is not transferred externally 1.7 litre capacity. Easy tip closure for drip-free and accurate dispensing with one hand. This kettle sits on a removable base that powers the kettle and swivel base allows the kettle jug to turn 360°, allowing both right and left handed users to use with ease. Also features an insulated plastic handle and removable lid. 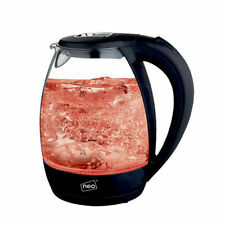 TurboTronic 1.8L LED Illuminated Electric Glass Kettle 360°. Introducing TurboTronic LED Electric Kettle line. ZL-LED03 is designed to impress. Itfeatures bright LED lights that illuminate the kettle. Camry CR1269W. Electric kettle 2200W 1.7L white, unique modern design. Electric Kettle Camry CR 1269 of max 2200W power sets new design trends among the electrical devices. - Unique design. - Colour: white. Cordless Electric Kettle 2200W 1.8L, Stainless Steel with Marble Effect - Black. Generous 1.8L capacity cordless jug. Removable and easy clean water filter. Clear water level indicator with marks. If you’re looking for a kettle that combines stylish design with superior performance, look no further than our superb 2200W Glass Kettle. The jug is made of strong and safe, heat resistant borosilicate glass, and has a unique ridged design. 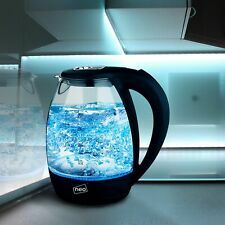 2L Illuminated Electric Cordless Kettle. Cordless glass kettle with stainless steel finishing. Boil dry and overheat protection. Neo Direct. Blue LED while boiling. © Neo Direct. For any kitchen. With three-Pin UK AC power plug. Concept Retreo. The Concept Retreo is a beautiful ceramic electric kettle with 1 l capacity. 1l Beautiful Ceramic Electric Kettle. Beside theoriginal looks, the electric kettle has all the functionality that modern kettles have - cordless with a rotational base,double protection system - automatically turns of when the water is boiled, and1 L capacity. Cordless electric kettle with 0.6 litre capacity and 360 degree base. -UK electrical plug. -on/off button with blue light indication. -optional wall mount, ergonomic handle, one touch opening, water level indicator. This is an. Automatic warming function (30 min) with temperature display. Precise display of the water temperature. Ergonomic handle. 360 ° base station / wireless. Cable rewind. Acoustic signal, automatic switch-off and dry protection. Ariete Retro Style Electric 1.7L Jug Kettle, Vintage Design, Beige. Condition is New. Dispatched with Royal Mail 2nd Class. A level gauge at the rear and a large lid opening ensure easy filling. A removable decalcification filter made of stainless steel works to directly improve the quality of hard water when pouring. Electric kettle in the tea kettle design of the 1950s. Fortune Candy 1500 W Electric Tea Kettle. When boiling is reached, it was automatically switch off. Stylish Design Cordless 1.7L Over Drip. Cordless Yes. Material Stainless Steel with Black Accents. Product Type Electric Kettles. Colour Black. Warranty 2 Years. Power 3000 Watts. Model Number 20413. Depth 22.8 cm. Cordless Electric Kettle 2200W 1.8L, Stainless Steel with Marble Effect - Red. Generous 1.8L capacity cordless jug. Removable and easy clean water filter. Clear water level indicator with marks. 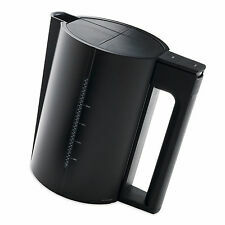 Kettle 1.5L Black Copper Electric Cordless Water Level Indicator Stylish. CORDLESS – the kettle sits snugly on the base power unit. STYLISH DESIGN – a sleek black and copper kettle that adds an elegant touch to any kitchen countertop. Make hot drinks in style with the Daewoo SCHOTT Glass Kettle with 1.5-litre capacity. It boasts 3KW power to boil water rapidly. The blue strip LED light and SCHOTT glass design make this kettle unique. This electric kettle will add an elegant design to your kitchen while providing freshly boiled water. Up to 1.8-litre max capacity electric kettle. TurboTronic 1.7L LED Illuminated Electric Glass Kettle 360°. Introducing TurboTronic LED Electric Kettle line. ZL-LED01 is designed to impress. Itfeatures bright LED lights that illuminate the kettle. ZCK0277I (Crystal 332.2). ELECTRIC KETTLE. Stainless steel and plastic construction jug with 360 degrees rotational base. Hot Products. The water tank features level markings for minimum and maximum fill points. Key Features New Products. NEW ARRIVALS.